History That Bounds Off the Page! “History as lively and irreverent as the characters it portrays. No marble statues here, but men and women as you’d like to meet them–and some you’re glad you didn’t meet.” ~ H.W. Brands, author of 25 books of American history and Pulitzer Prize nominee. Making History Fun and Relevant! In this two-book debut, authors George and Betsy Christian have made Texas history bound off the page. 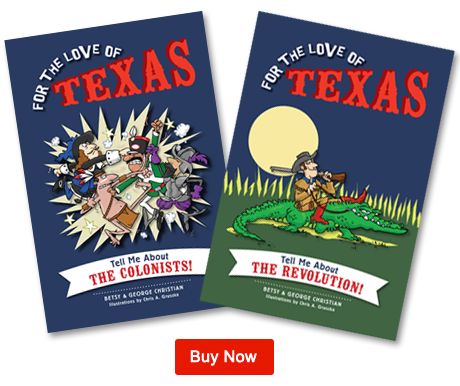 These lively books are geared toward students and contain chapter titles like “The ‘Old Americans’ – And We Mean Old!” “Rabble-Rousing” and “Come and Take It!” The books cover everything from early Native American movement to the time of the presidential election of the Texas Republic. 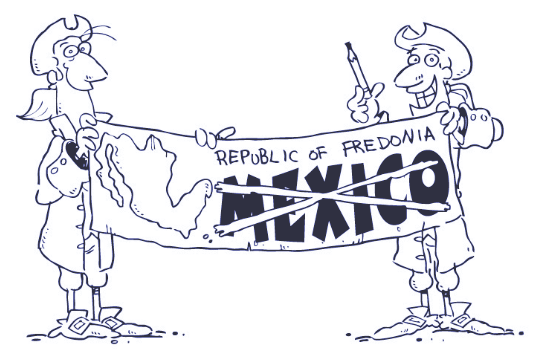 George and Betsy Christian challenge their audience to look at history from different perspectives and to think about why history is recorded the way it is. This call to think independently and ask questions, in addition to side passages with historical biographies, extra stories, and fact versus fiction accounts makes these books a fantastic resource for young readers. For the Love of Texas clearly traces Texas history to its effects on Texas today and explains those connections in a way that students will easily understand. With movie references, lists and quizzes like “Are You More Like Houston or Austin?” and witty illustrations by animator Chris A. Gruszka, these books make history fun and relevant for all.